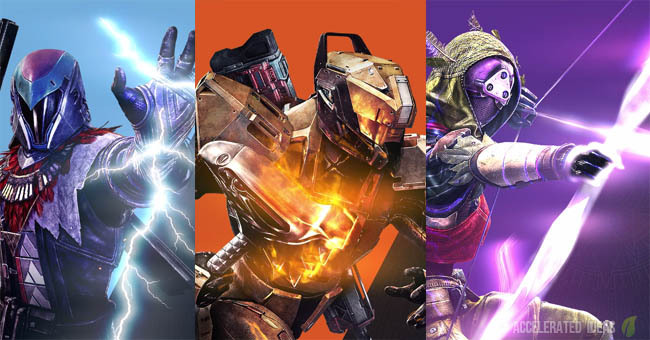 Bungie have officially revealed the new Destiny subclasses at E3 2015, they are: Sunbreaker, Nightstalker and Stormcaller. Starting with the Taken King DLC expansion, players will be able to use the new Solar Titan, Void Hunter and Arc Warlock variations along with a tonne of new story missions, strikes and a brand new raid activity. We all knew that the Taken King would be the next expansion for Destiny but no one really expected a full reveal for all of the new subclasses this early. Bungie went as far as listing each of the new class abilities including the new melee attacks, grenades and unique perks for each of the variations. Interestingly, the Titan and Warlock both come out on top this time around so you might want to consider levelling one (or both) of those if you haven't already. The new Solar subclass for the Titan is both a projectile and melee variation, and arguably the best of the new subclasses in the Taken King. One look at this class will surely tempt many players to start levelling a Titan. The Hammer of Sol super provides your Titan with a flaming hammer at your disposal. Not only is this an incredibly strong melee hammer but also a mid range, high impact projectile that you can throw at enemies. During the trailer for The Taken King we can clearly see that using the hammer as a melee weapon is strong enough to disregard enemy shields, knocking back enemy Cabal with ease. After activation, players can throw several flaming hammers or perform several hammer melee attacks, all the while the Super meter drains in the background until depletion; at which point the Super effect wears off. When this grenade explodes it sends a direct line of fire towards the enemy. In effect this is similar to a tracking ability when bombs explode into clusters and track the nearby targets. The difference here is that the fire projects across the ground, homing in on the enemy. The Sunbreaker's melee attack provides your Titan with a similar melee to the Warlock Sunsinger. Enemies hit by Sunstrike will catch fire and burn for a short duration. 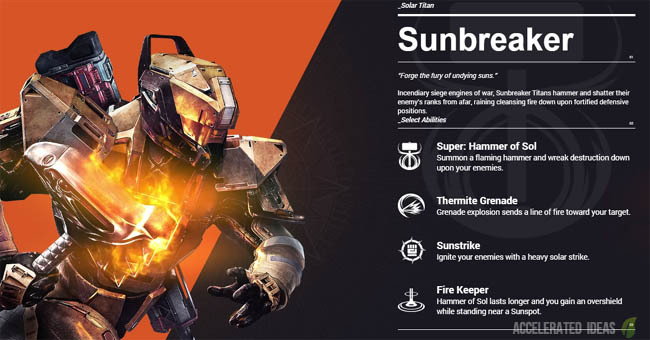 This unique perk increases the effectiveness of the Sunbreaker's super, giving the Titan a longer Hammer of Sol but also providing a protective overshield while standing near a sunspot. The Nightstalker subclass gives Hunters the missing Void damage type and pushes this class towards a strategic defensive Guardian - much like the Defender Titan. The suppression abilities from both the Super and Grenade make this subclass a good Raid companion but probably less of a solo players choice. A projectile bow and arrow weapon gives your Hunter the ability to ensnare or trap enemies in a Void Anchor. This trap effectively slows down enemy movement, suppressing them for the benefit of you and your teammates. It doesn't appear to offer an damage and thus is purely a strategic weapon, useful in Raid groups but less so when playing solo. Upon explosion this grenade creates a wall of Void light, slowing down the enemy. Very similar to the suppression grenade from the Titan defender subclass. Another projectile perk, this smoke bomb will disorient anything caught within the cloud. Again this is a strategic attack and one which doesn't causes any damage. A quick evasive maneuver that allows the Hunter to side step an attack extremely quickly and avoid damage. The Stormcaller subclass turns the Warlock into a true magician, providing strong attack options with ridiculous range. 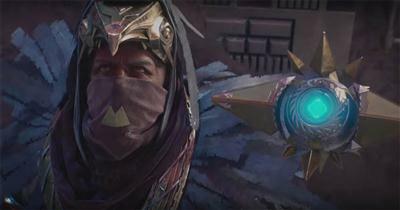 The prime example is the new melee attack which gives the Stormcaller a long ranged melee that electrocutes the enemy. The Stormcaller's super is a medium ranged, projectile "stream" that electrocutes the enemy with several bolts of "chained" lightning. During the Super's duration, the warlock will levitate and movement speed is greatly increased. This allows players to swiftly move into an area, hover side to side and clean up multiple enemies in one go. During the demonstration at E3, we saw a Warlock take on a rush of Thrall's, easily brushing them aside. It appears that the damage from this Super is split between each of the lightning strikes so players will need to maintain a focused attack to inflict damage against a single stronger opponent. This grenade summons a lightning storm within a small vicinity thus making it more of a strategic grenade for blocking enemy movement or dispatching a cluster of enemies. A similar perk to those seen on the recent Exotic gear, Perpetual Charge will recharge your melee when you get grenade kills and vice versa it will recharge your grenade from melee kills.